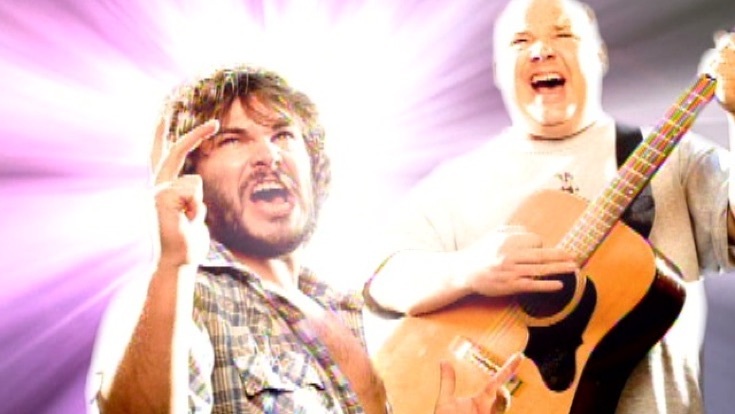 If you’re not familiar with the band Tenacious D, you might be familiar with either actor Jack Black or his partner in crime, Kyle Gass. Together the two entertainers have created one of the most unique and talented musical acts out there. The “D” is about to release their newest song, “Take Us to Space”; I couldn’t help but wax nostalgic over some of the best moments in their now, long career. My favorite, no matter how cliché, will always be the official “Tribute” music video. “Tribute” was released in the summer of 2002 and is a comedic rock song that references a battle between a demon and “the best song in the world.” The song is a tribute to the ‘greatest song in the world’, which the duo came up with but has since forgotten. The music video stars Black and Gass and is directed by Liam Lynch. The duo finds themselves in a shopping mall with a karaoke-style recording booth where they record their tribute to the greatest song in the world. The video has cameos from a few recognizable people including Ben Stiller. Also appearing in the video, disguised as the demon, is rock god Dave Grohl.